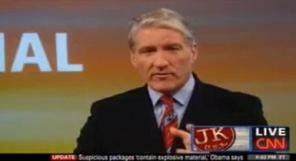 This morning, Page Six published an item entitled “John King’s magical wall sent him over the edge just days before the election.” The story goes that a malfunction involving the “magic wall,” CNN’s giant touch screen, caused King to have an “onset meltdown” which led to a private reprimanding Turner Broadcasting System CEO and chairman Phil Kent. King has released a statement calling the report a “fantasy” – but he was clearly pissed about something that day. The DC-based anchor had a meltdown while anchoring his 7 p.m. show, ‘John King USA,’ from CNN’s New York studio just days before the midterm elections. After a slew of technical and editorial errors, King lost his cool when his signature and somewhat overworked touch screen malfunctioned. ‘I wish I brought a gun to work,’ King yelled at studio operators on Oct. 29, according to several CNN sources.